I have over 30 years experience in the software development industry. About 12 years ago my interests turned to day trading. I was a miserable and utter failure. But I learned from my mistakes. One thing i eventually learned is that most markets are dominated by a few, well informed, well financed traders. They can and do move or stop the market moves. Trade against them, and you make their day. Avoid their traps and getting trampled by them and you live to trade another day. For the last 3 years I worked closely with several institutional traders and trade firms and saw the inside of their methods, knowledge and power. 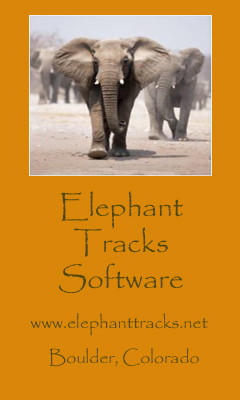 Out of that experience and insight was born our first tool: the Elephant Tracks Indicator. I decided to price the indicator so that any retail trader could afford it--and at a price that made the decision to purchase an easy one. Some have even said that the tool is so simple they could build it themselves. To which I replied: yep! If you can then you should-however, at $99.95 - why bother? If you can't make more than $99.95 trading in the time it'd take you to build your own tool, you should stop trading! That is why I built and offer you the indicator for a one-time fee and at such a low price point.